It is an enduring personal tragedy that I can never think of 'zinger' responses to hurled insults until having ruminated and turned them over in my mind for some time. It is, perhaps, the effect of living the intellectual, academic life that I must cogitate on a statement before I feel ready to supply a well-reasoned reply. But how come an ordinary white Aussie sheila with some five- or six-generations worth of Anglo and Celtic colonial settler heritage on both sides might be subject to such racist barbs in 21st century Australia? A delicately-pinned scarf and a long dress signal to every testosterone-overloaded yobbo that I'm a Muslim. And to an unsophisticated racist, all Muslims are Arabs and all Arabs are terrorists. If I took off my headscarf it would be problem solved; I'm back to being a perfectly acceptable white Australian woman, unless I reveal my religious identity in other ways — in the food I do and don't consume or the prayers I perform every day even when I'm away from home. Most other Muslims don't have that luxury. Skin colour, names, accents, and other embodiments of belonging to historically-Muslim racial groups indelibly mark them as Other. Prejudice is a power relationship that places one group of individuals at the top of a hierarchy of privileges against which all other groups are negatively compared to varying degrees. Thus, disability, skin colour, ancestral heritage, education-level, gender, sexual-orientation, religious adherence, socioeconomic status, refugee status and more are all barriers that hinder a person's access to privilege. Imagine being a poor, black, African, disabled Muslim lesbian refugee! This is why racism is not only for those at the top of the hierarchy — historically, the WASP male. To challenge the prejudices of those lower down in the privilege hierarchy through, say, education or socioeconomic status, via mechanisms like affirmative action, is to endanger the level of privilege they tenuously possess. Which brings me back to Islamophobia. Islamophobic racism is a blunt weapon. It is aimed just as devastatingly at non-Muslims who look a bit too Muslim: brown Sikhs and Hindus wearing turbans, hirsute Greek Orthodox priests, and Arab Christians. "While Richard Dawkins is correct when he points out that Islam is a religion not a race, in the real world Islamophobic racism indiscriminately trawls and catches those merely appearing to be Muslim." Earlier this year, a woman sitting in her American Airlines plane seat next to a bearded man became worried about the strange scribbles he was jotting down and called the flight attendant to complain of feeling sick. After she was taken off the plane, she revealed she was not sick, but worried the man might be a terrorist. It turned out he was an Italian University of Pennsylvania economics professor who was solving differential equations for a paper on menu costs. He was taken off the plane for investigation, but authorities later allowed him back on. Still, even the appearance of writing Arabic and giving a cold-shoulder response to a nosey seatmate was enough to trigger an Islamophobic response in this woman. This is why Islamophobia overlaps on many levels with racism, because while Richard Dawkins is correct when he points out that Islam is a religion not a race, in the real world Islamophobic racism indiscriminately trawls and catches those merely appearing to be Muslim. It is not the classical racism of the Ku Klux Klan, in the 'your skin colour makes you inherently inferior to me' sense of the word. The newer forms of racism work more subtly. If your genome puts you in a group that is historically Muslim-majority — and here we are talking mostly Arabs, Africans and Asians, albeit some Europeans too — or even if you look like you might belong to one of those groups, Islamophobic racism encodes you as belonging to an inferior culture, which leads to experiences of discrimination, vilification and at the pointy end, violent hate-crimes. My response: If the British invaders will return the ancestral lands of my Irish great-grandfather I will gladly go. The appreciation of self as different is a built in human trait as old as Humanity. Racism is born of that and is also a basic human trait. It is not going to change when human beings are not prepared to change to fit into the society in which they choose to live. 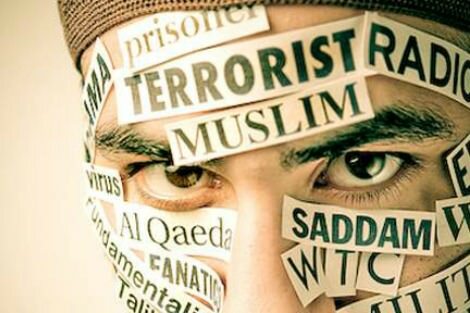 Islamophobia is no different from the Westophobia of many Muslims, the Anglophobia of many Asians or any other racially based phobia.. All are indulgent human weaknesses to which we are all prone at times. I love your picture. To a very old lady like me, you look exactly like a Catholic nun, strictly speaking a religious sister. How times change and how ridiculous are ignorant prejudices! "Christophobia" is exceedingly more serious than Islamophobia. World-wide, Christians have far more to fear from Muslim violence than the reverse. See how many Christians are murdered or have violence committed against them here: https://www.thereligionofpeace.com/attacks/christian-attacks.aspx. How many of the people associated with the following web-site would remain alive or free if they were in Islamic countries: http://www.centerforinquiry.net/secularislam/ ? Violent hate-crimes by Muslims are common. See what they do in Pakistan, for instance: https://en.wikipedia.org/wiki/Christianity_in_Pakistan#.27Islamist.27_violence_against_Christians or in Bangladesh: https://www.christianfreedom.org/christianity-growing-in-bangladesh-despite-increased-persecution/ Or read the following articles (SMH and ABC): http://www.smh.com.au/comment/these-crimes-have-everything-to-do-with-islam-20150111-12lxmn.html 19 out of 20 organisations listed as terrorist organisations by the Australian Government are Islamic: http://www.abc.net.au/news/2015-02-25/fact-file3b-five-facts-about-terrorism-in-australia/6226086 All these facts speak for themselves. It is a fact that people react to violence in different ways. One way is to hate the perpetrator of violence. Another is to react in equal measure. Islamophobia is a rational response to the factual evidence of the amount of violence perpetrated by people claiming to be Muslim against those who do not. Christians are called to love one another, even their enemies. It is clear that many Muslims in many Islamic countries see all non-Muslims as their enemies, otherwise all this violence simply would not occur. Jesus said “By their fruits you shall know them”. The highly visible fruits of Islam in the modern world demonstrably include murder of; and other violence against many others. Is Dr Woodlock proposing to re-educate all Muslims against this disordered way of thinking?
" Islamophobia is a rational response to the factual evidence of the amount of violence perpetrated by people claiming to be Muslim against those who do not." Let's not fall into the trap of using words constructed for political advantage. There is very little 'Islamophobia' in Western societies. A phobia is a derangement. Most citizens of liberal democracies do not break out in hives when they see someone who could be a Muslim. There is, however, a fair bit of Islamoscepticism in which one is q.
I personally do not think that the war of words between some Muslims and Christians helps us to fix the huge problem that we face from violence in today's world. The fundamentalists of the two religions are responsible for the intolerance of the other group. And other religions also have their fundamentalists who commit violence against others because of their intolerance. However, the group I fear the most are the extreme right wing fundamentalist Christian groups in the US that openly support the US Military Industrial Complex which has caused most of the wars since World War 2. Much of the violence from jihadist groups is a response to this. Former British PM Tony Blair admitted that the formation of ISIS was a reaction to the US unnecessary war in Iraq which he strongly supported. People of goodwill of all philosophies need to work together to say no to the nightmarish violence we see in our world. In Australia, progressive people need to be working to make Australia free, independent and non-aligned. We have lost too many young people in US instigated wars. Thank you to Rachel for a very thought-provoking article. In our multiracial society there should be no hint of racism or discrimination or it could be our undoing. I was very interested that Rachel referred to pastor Martin Niemoller's poem. The full wording is as follows: "First they came for the communists, and I did not speak out - because I was not a communist; Then they came for the socialists, and I did not speak out - because I was not a socialist; Then they came for the trade unionists, and I did not speak out - because I was not a trade unionist; Then they came for the Jews, and I did not speak out - because I was not a Jew; Then they came for me - and there was no one left to speak out for me." Niemoller became a Lutheran pastor after WW 1 having been a U Boat captain during that war. Originally, he supported Hitler, but took a stand against Nazism which caused him to be held in a concentration camp for many years. At a meeting of the World Council of Churches after WW2, he read out an apology from the German churches because they did not do enough to halt the spread of Nazism. Evidently, there were not many dry eyes because delegates realised that Niemoller had suffered more at the Nazis than others in attendance. Martin Niemoller went on to be president of the WCC for a number of years and an activist for peace If he was living now, I am sure that his poem would have begun "First they cam for the Muslims"! The Niemoller story should be a lesson in international understanding. 'We're not going to allow people who have sought to come by boat to come to Australia through a backdoor and we are not going to allow sham marriages to facilitate that,' said Peter Dutton. Given all the existing checks and hurdles, why have a ban? It would only affect about 2000 people; the other 35,000 who came by boat before 19 July 2013 or were not sent to Nauru and Manus Island are not affected. The true intention is to further punish the people we dumped on our Pacific neighbours.